Braids are really in right now — and there are tons of diﬀerent kinds of braids and braiding techniques to get inspired by. Some will keep your hair tidy, others will transform it into a work of art — while others will do both! If you don’t have much time to spare for creative braid hairstyles – don’t worry. Even with a basic loose French braid you can create countless trendy styles in no time at all! Here is a simple tutorial in which I will explain and show you how to create a loose French braid on yourself – but if you wanted to do it on someone else, the steps will be identical. A loose French braid works on hair of any length — and will look stunning even on short locks! Now you know how to french braid your own hair, so let’s move to the creative hairstyles with simple french braids I’ve prepared for The Right Hairstyles’ readers! Keep reading! How to Create Hairstyles Based on a Loose French Braid? Use these ideas because they’re easy, quick and stylish! Even if you’re not good at braiding your own hair, I promise these styles will become your favorites! A ﬁrst easy variation would be to start the braid on one side and go towards the opposite angle of the head, for a diagonal French braid. You can spice up the style by moving the French braid to the side of your head. Continue braiding as with a normal French braid but start taking hair from the top of one side and keep braiding it downwards, while continuing to add hair from both sides. Another way to end the braid on one side would be to start braiding behind one of the ears, and go all the way down, angling the braid towards the opposite side of the head. This results in a low braid which will frame the nape of the head and will then lay on your shoulder. Very easy style which can be very sophisticated as well! Using a side French braid, you can part your hair in the middle and do two braids instead of one, so to have these piggy French braids. Grab your French braids and roll them into two braided buns, which you can keep in place with an elastic or bobby pins. You will then have this cute style – which is perfect for warm days, so not to have any hair sticking to your neck! Another option is to stop braiding at the base of your head and tie both braids with elastics, leaving the rest of the hair as a pair of simple pigtails. You can also cover the elastics with small strands of hair, and keep each strand in place with a bobby pin, topsy tail or a new elastic. You can do that even with a single French braid! Another way to do something original with a simple French braid is to part the top of your head taking just the hair from the middle, then braiding the rest – but stopping to add more hair when you reach the crown of your head. It creates a really nice effect and it is the perfect base for a lot of edgy styles, as you can make it messy and bigger depending on the look you are aiming for! The mohawk French braid is the perfect base for a ponytail style. After doing the mohawk braid, you simply have to put all your hair in a ponytail (high or low – that’s up to you) and include the braid in the ponytail. You could even leave the braid out for a different style, so that it will fall next to it – you decide! Another super easy hairstyle could be achieved by French braiding from the front of your head, as you would do for a headband. Simply braid the top and keep going on one side, but braid just the upper part. Then plait the rest and hide the end of the plait under the hair on the back of the head, on the opposite side. This style is very versatile — and could even be wrapped into a cute ponytail! If you are looking for something a little edgier — but still simple and fast to create — try braiding the hair on the side of the head towards the back and finishing it when you’re satisﬁed with the length. The rest of the hair would be kept loose. A French braid is very simple and is a perfect way to create an updo. To start, French braid the top of the head, from the middle or from one side – and tie it with the rest of the hair in a ponytail (which you can then transform into a messy bun, too)! And here’s a similar style, which is very quick to do and is really elegant. It can be done by French braiding one of the sides of the head and the nape towards the opposite side and ending the style with a twisted bun. I love twisted buns, because you can make them very big and ﬂuffy – a bonus for someone whose hair is thin and often appears flat! Another option for using the French braid in a fancy way is turning it into an upside down braid. This one is a little bit harder, especially if you try to do it on yourself. Essentially, it’s a normal French braid, which starts at the bottom of the nape and then goes up. Staying in a position where your head is upside down will make things easier. Part your hair so that you will have to braid just the back of it up to the crown of your head. Then tie everything into a ponytail! You can also wrap the braid around the elastic. Instead of leaving the hair in a ponytail, you can twist it into a lovely bun for a different style! Or try a different kind of bun! These styles look fantastic with long hair, but most of them will look super cute on short hair, too! We hope you’ve been inspired by these trendy loose French braid styles, and that you’ll be experimenting with them later! 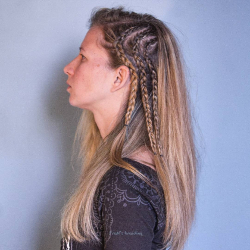 For more unique and beautiful braids, follow FraN’s braiding on Instagram and check out her channel on YouTube!